This morning I received another email from a client who doesn’t want her Facebook contest app to require app installation and permissions from her participants. She believes this will reduce her conversion rate. I explained to her that the app installation requirement was, by far, the best option to create value for her Facebook Page and offer the best possible experience to her fans. Last May, I published an entire blog post on this very subject. It’s the only way to offer a social context within your app. Examples include comparing your quiz score with your friends’, seeing what your friends have voted for in a fan vote contest, or checking your friends’ entries in a photo contest. Without an app install, none of this is possible. There will be no fun social context in your app. Your participants’ experience will be okay at best, boring at worst, but never entertaining or fun. It’s the best way to reward fans for inviting their friends. More about Facebook Contests and virality in this post. It is the best way to reduce cheating and ensure you are recruiting genuine fans. Trust my experience with thousands of Facebook contests, cheating IS a serious issue. App install is the only way to include a fan gate on mobile devices. In some instances, mobile users can make up one third of the overall number of a campaign’s participants. That’s an opportunity you don’t want to miss! You cannot have a like gate for a Facebook contest (i.e. force participants to like your page in order to enter) unless your participants have installed your app first (asking them to install the app is the only way to know whether they have already liked your page or not). App install is the only way to leverage each participant’s data for the long term, and build a valuable database of fans and potential ambassadors to leverage later. I am a big proponent of Facebook CRM. There’s little long-term value to any campaign without it. If you don’t require the installation of a Facebook app, you won’t be able to track each participant’s activity throughout all of your campaigns and on your timeline. The data you will collect will be essentially useless. Are you really ready to invest a lot of time and money into your next Facebook campaign to just throw away all the data you’ll collect? Offering a social context is one of Facebook’s unique advantages. 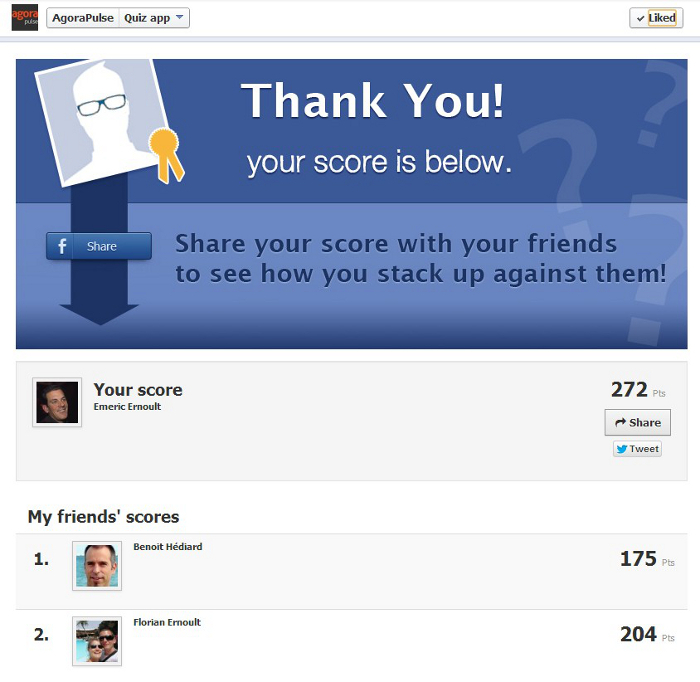 In a Facebook Quiz, the social context offered by the app install will allow each participant to see how she is stacking up against her friends. This type of entertaining context would not be possible if she had not installed a Facebook app. All right, enough of the pros and cons. Let’s get to the hard facts. At the end of the day, what’s really on your mind is whether or not requiring your Facebook contest participants to install your app will damage your conversion rate, right? So, let’s look at the conversion rates for 6 of our most popular apps over thousands of campaigns run by thousands of different brands from September 1st, 2012 until August 1st, 2013. In order to be more transparent, I’m copying screenshots of the Facebook insights for each of these applications below. In a nutshell, the average conversion rate is around 70%. The lowest average conversion rates belong to apps where there is usually nothing to win (Fan Vote). So, when it’s just for fun and there’s no benefit attached to giving away their profile information, fans will be more reluctant to do so. Duly noted. The variations between campaigns can be very significant. The best get conversion rates close to 100%, whereas the worst can get as low as 30%. 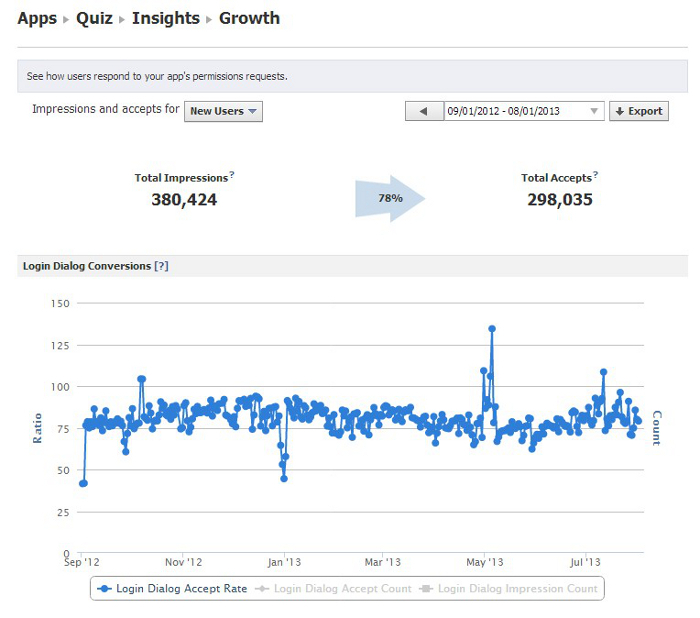 On average, over an 11 month period, 78% of our Facebook quiz participants have installed the app. Median conversion being between 70 and 85%. 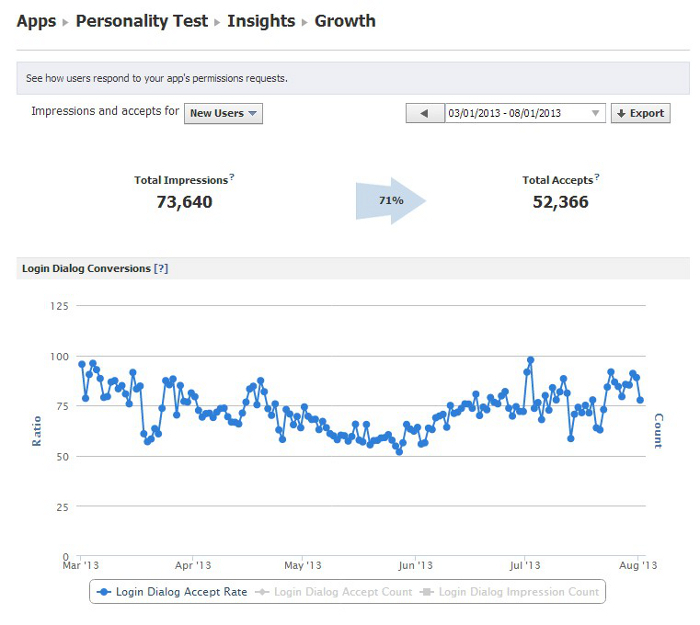 On average, over an 11 month period, 71% of our Facebook Personality Test participants have installed the app. Median conversion being between 60 and 80%. 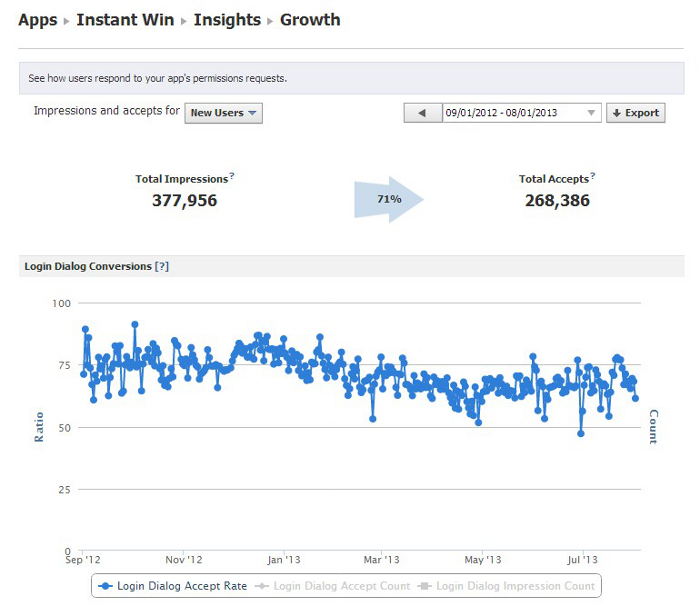 On average, over an 11 month period, 71% of our Facebook instant win participants have installed the app. Median conversion being between 65 and 80%. On average, over an 11 month period, 70% of our Facebook photo contest participants have installed the app. Median conversion being between 60 and 75%. 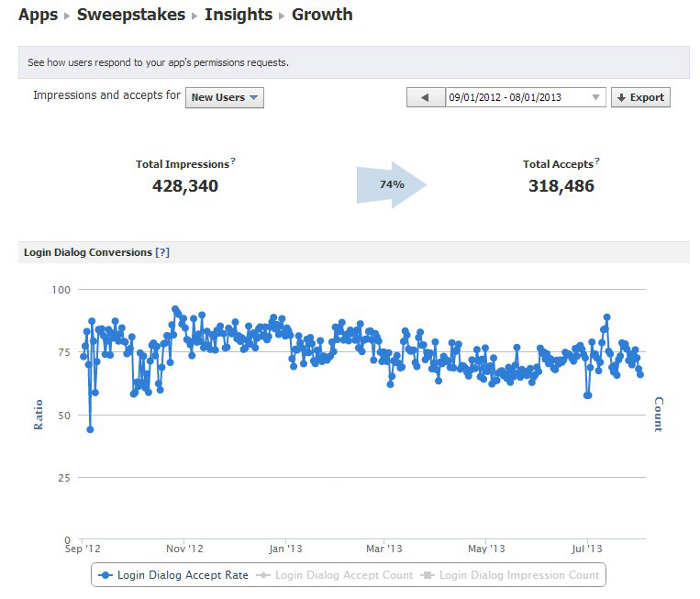 On average, over an 11 month period, 74% of our Facebook sweepstakes participants have installed the app. Median conversion being between 70 and 80%. 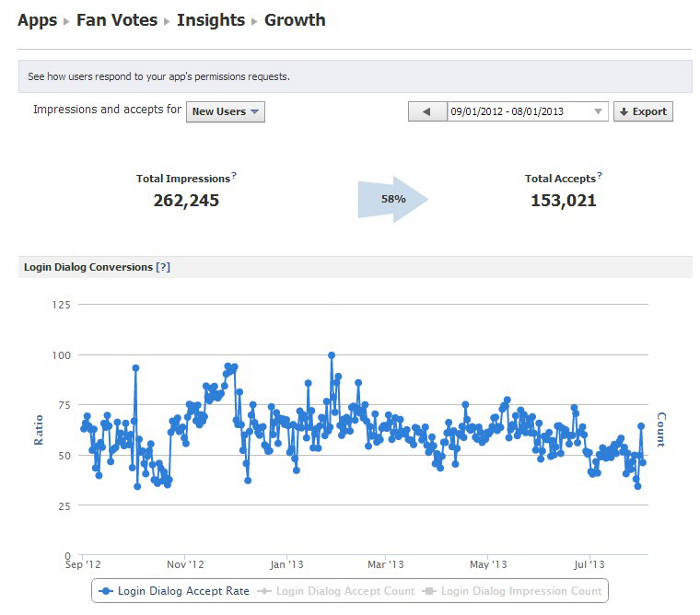 On average, over an 11 month period, 58% of our Facebook fan vote participants have installed the app. Median conversion being between 55 and 70%. This is the lowest score among all of our benchmarked apps, but this is also the only app for which there are generally no prizes offered. There can be a HUGE difference in terms of conversion rate from one campaign to another. So, what are the criteria separating the great campaigns from the not-so-great? The answer is simple, and can be summarized in two words: Trust and Reward. The more your participants trust you, the more likely they are to give away their information. The more attractive your reward, the more likely they are to enter your campaign. Attractive doesn’t necessarily mean expensive. You only need to ensure they’ll be considered highly valuable by your audience. There’s not much you can do for your brand’s credibility in the short term. If you’re already a well-known and trusted brand, people will be more likely to trust you with their data. If you’re not well known and trusted yet, you’ll need to do well in the following two criteria. Your campaign’s credibility will address one legitimate question on your participants’ minds, especially if you are not a globally trusted brand: Are these guys serious, or are they just trying to get my email address and Facebook credentials so they can spam me for the next 5 years? Looking serious is the first thing you need to concern yourself with. Don’t be too cheap on your campaign’s design. If your visuals look like they’ve been created by some kid for $5 on Fiverr, it’ll be hard for your campaign to inspire trust. Good looking visuals should not cost you more than $100 if you find the right freelancer. This is a small investment that will make a big difference. Concerning transparency, it’s pretty simple: Draft clear (and well written) rules, feature the winners of your previous campaigns and comply with all applicable laws. This should all go without saying, but surprisingly, many Facebook contests and sweepstakes don’t. Your brand’s credibility, your campaign’s transparency and the attractiveness of your prizes will have a HUGE impact on the conversion rate. A well-known and trusted brand will achieve higher conversion rates, lesser known brands will have to work harder. Trips to the Caribbean will attract and convert more users than a bunch of coffee mugs. Makes sense. An average conversion of 70 to 80% is not bad at all. If you look at Facebook’s own internal data, they consider 80% to be very high. In fact, only the best apps have conversion rates in the 80% range according to Facebook (Foursquare and songpop are cited as examples). 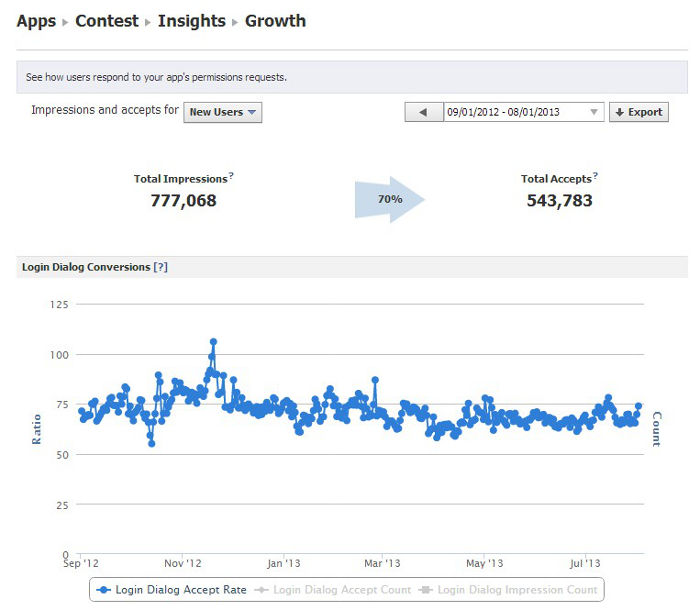 So, on average, your humble sweepstakes may get the same conversion rate as a giant brand like Foursquare. Not bad. According to Hubspot, Sweepstakes overall entry conversion rates are typically between 20 and 40%. 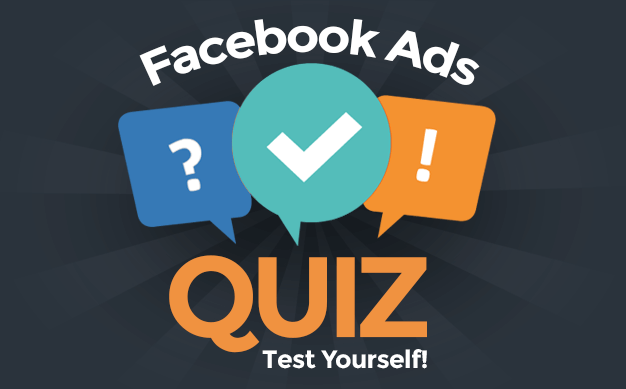 When you see a 70 or 80% conversion for your Facebook sweepstakes or contest app, you may think, “I’m losing 20 to 30% of my potential participants!” Look at the numbers and think twice! No sweepstakes or contests run on the web have a 100% conversion rate. According to our own internal data, simply asking for a first name and email address can drop your conversion rate by 20%. And each additional field you add (date of birth, Address, phone number, etc.) will add to the loss of conversion. A form with too many fields may make your conversion go as low as 30 to 35%. On the other hand, once you’ve asked for a Facebook app install, the conversion rate on a simple form with less than 3 fields is between 90 and 100%. Once participants have installed a Facebook app to enter your campaign, they are very likely to fill-in a form as well, as long as it’s not unreasonably long. The bottom line? Facebook app install conversions are generally no lower than that of a typical web form, and many times, your rate may be higher. I’m convinced that the value behind Facebook is in building a stronger connection with fans you know. If you want to engage with your customers, you’re going to have to provide them with the best social experience Facebook can offer, and you just can’t do that without requiring an app install. What do you think? 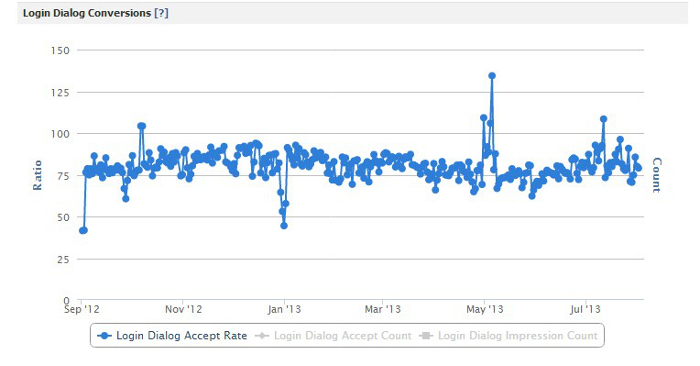 Have your experiences with app installations and conversions been positive or negative?